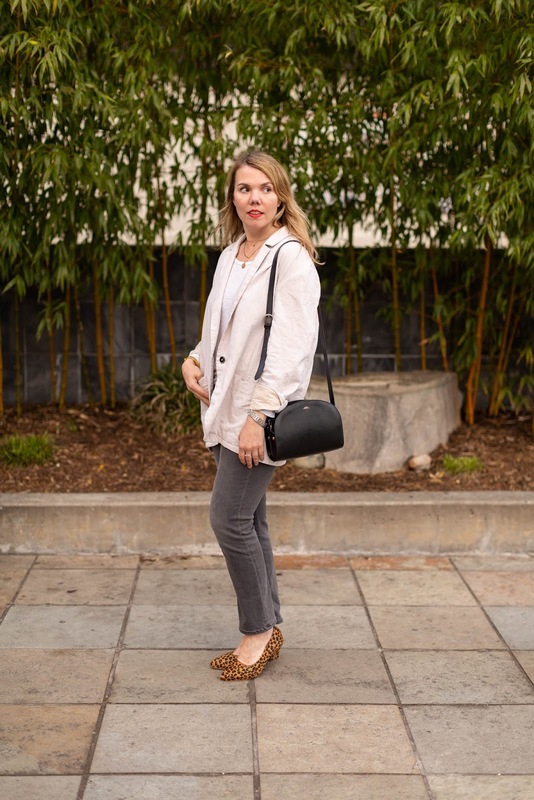 I am a year-round blazer girl, but I've always wanted the perfect linen blazer for warmer weather. As I mentioned earlier, I've bought (and returned or re-sold) several in recent years, but so far I'm like 90% happy with this one. It was part of my Free People birthday shopping spree, with last week's turtleneck, and as with the turtleneck, I probably should have sized down to an XS, hence that missing 10%. But I kind of like the extra-slouchiness of this one, and I have a feeling it will get even better with age. One of the things I like most about this blazer is that it's machine washable, which comes in handy when you're wearing it in high summer. It also comes in a bunch of colors if this light, wheaty shade isn't your thing. 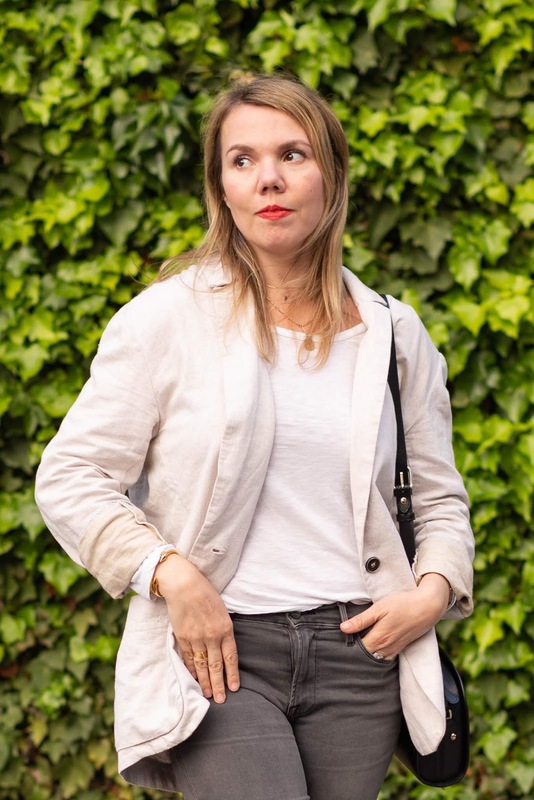 I've been on a light-neutrals kick lately, and we shot these on a rare warm spring evening, so I got away with layering it with one of my favorite white tees (you last saw it with a kimono). This one is by Marine Layer, which is a San Francisco-based brand known for its incredible softness. There's a bunch of cute stuff in their spring catalog, and I am long overdue for a trip to their store. Do you know anyone who, when they find a clothing item they like, they buy it in multiple colors? I am generally not that person, but after years of searching for the perfect gray jeans, I finally tried one of my favorite cuts, Le High Straight by Frame (here they are in blue), and promptly felt like an idiot for not thinking of it sooner. Since I've been searching for white jeans too, I clearly need to order a pair in that color as well. Anyway, these jeans are crazy soft with a lot of stretch, but the denim is thick enough to not feel see-through or flimsy. I sized down to a 27 for more of a straight-skinny fit, although I've found myself doing this a lot lately and have started to wonder if I'm actually a 27 now and not a 28. Are jeans getting bigger? 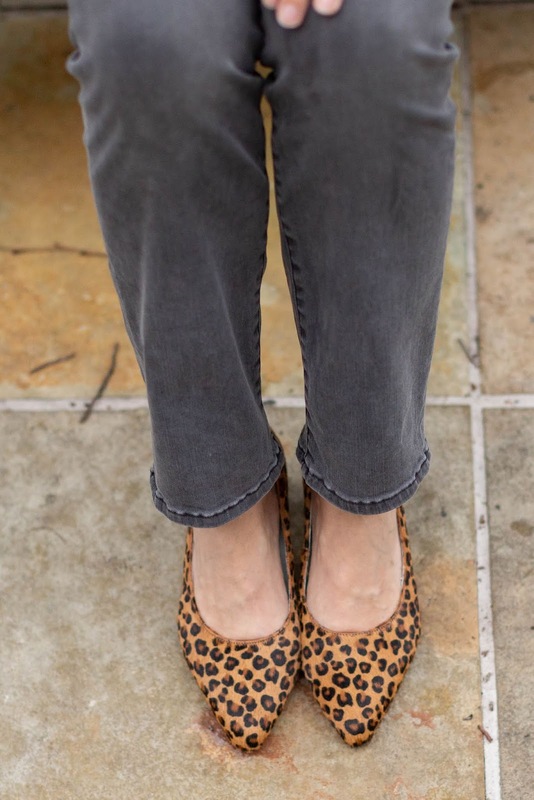 Speaking of sizing down, I'm wearing a 38 (instead of my usual 38.5) in these leopard-print haircalf pumps that the lovely people at Calla sent me. 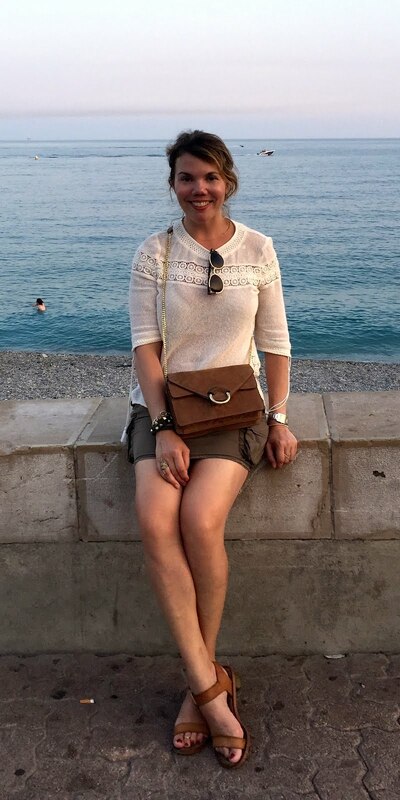 Calla's shoes are made for people with bunions (yep, I've got 'em), and I've found I can wear a smaller size, instead of unintentionally sizing up to accommodate my bunions. These shoes are so ridiculously comfortable, I walked 12,000 steps in them on the day we shot these photos! The kitten heel is just right, and the pointy toe does not pinch at all. 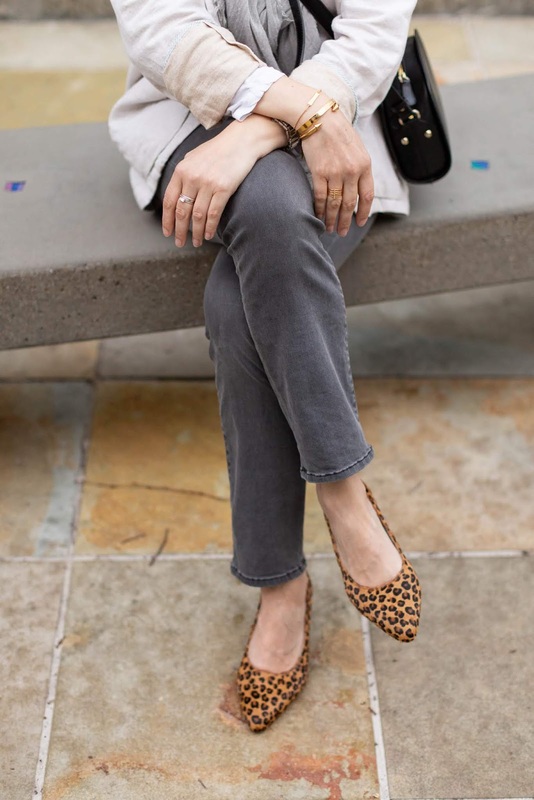 I fall into the leopard-is-a-neutral camp, so I thought they were the perfect way to finish this outfit—they lend my look just the right amount of polish. I had wanted to shoot these photos amongst the cherry blossoms in Japantown (like we did last year), but the buds were only just starting to poke out, so we were a bit early. Thankfully, there are all manner of cool backdrops, and lots of tasty ramen to eat afterward—I recommend Hinodeya! I rarely get it right on the first try too. I love everything about this look, your linen blazer is fabulous! My favorite white tee in my closet is by Marine Layer when I worked with them earlyon. So soft! I love the linen blazer and your grey jeans. I have bought one thing in multilple colors if I really like it and think the style may not be around. The shoes look fab with it too. It funny as I have been looking at linen blazers myself, cant wear them here in the dead of summer though, too hot for NC!